The third installment of the "Founding of New China" series will release on the 90th anniversary of the founding of the People's Liberation Army. 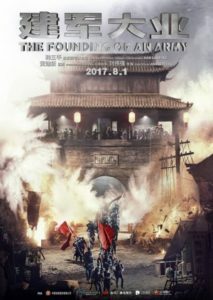 Epic propaganda action movie The Founding of an Army (建军大业) will release in China on August 1, 2017 to commemorate the 90th anniversary of the founding of the People’s Liberation Army. The Founding of an Army is the third installment of the high-profile “Founding of New China” series of historical propaganda films funded by the state-owned China Film Group. Consistent with its predecessors The Founding of a Republic (2009) and The Founding of a Party (2011), the film features a star-studded cast of Chinese A-listers including Liu Ye (reprising his role as Mao Zedong), Wallace Huo, Guan Xiaotong, Zhou Dongyu, Han Geng, and many more. According to Douban, the film will kick off in 1927 with the Nanchang Uprising (the first major Communist-Nationalist engagement of the Chinese Civil War) and Autumn Harvest Uprising. It will be interesting to see if The Founding of an Army learns from the mistakes of its immediate predecessor, The Founding of a Party, which was widely panned (even by the Global Times) for lacking focus and relying too much on high-profile cameos.